Zhaire Smith (Texas Tech) greets NBA commissioner Adam Silver after being selected as the 16th-overall pick. After a lot of hemming and hawing leading up to the draft about possible trades and moves for "hotter" names, it ultimately came down to the local kid. With the No. 10 pick in the 2018 NBA Draft, the Sixers went with Villanova's Mikal Bridges, a player they'd been connected to long before the draft process began in earnest. 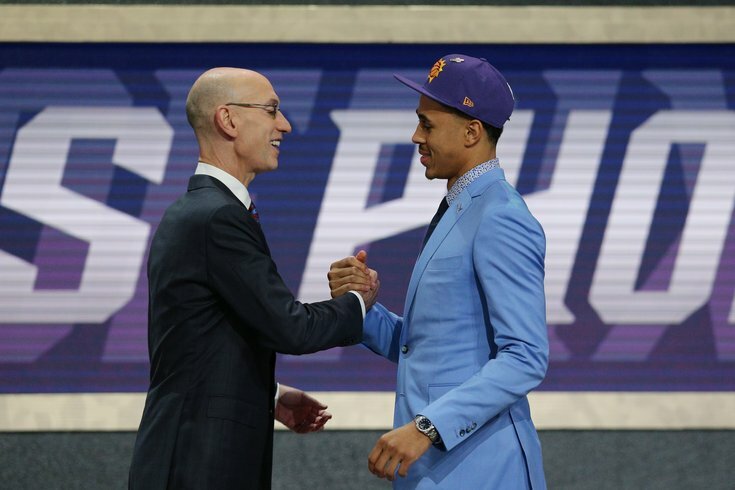 UPDATE [9:18 p.m.]: The Sixers have reportedly traded Bridges to the Suns for 16th overall pick Zhaire Smith and a future first-round pick. Philadelphia saves close to $1M in cap space by going from 11 to 16. Every dollar will help when it comes to creating room for a potential max player this summer. Click here for full analysis of the trade and more on what Smith brings to the Sixers. It may not be the highest upside or the sexiest pick in the world, but Bridges slots right into what the Sixers want to do. Standing 6'7" with a wingspan over 7' long, Bridges is long, springy athlete who will give Brett Brown another wing to beef up his defense. A three-headed monster of Bridges, Robert Covington, and Ben Simmons guarding the 2-4 spots is as good as it gets, with switchability and athleticism all over the place. At his best, Bridges will flash lockdown on-ball defense that combines the necessary physical tools with a keen awareness of where the physicality line is. Even while dealing with whistle-happy referees at the college level, he was able to hover on that line between physical enough to warrant a foul and soft enough to allow a clean look. Bridges' best defensive possessions were up there with anybody on the wing in college basketball. The downside: he's simply not big enough to credibly guard some of the oversized wings of the world — LeBron James would make him look like the Monstars before they stole NBA players' powers — and it's hard to see him adding enough bulk to be able to close that gap over time. Post-ups are not as big of a concern in the modern NBA as they might have been around the turn of the century, but Bridges didn't cope all that well when he was forced to switch onto bigger offensive players in college. They only get bigger from here. Bridges will likely be capped as a good team defender and capable of dealing with the small-to-medium two's and three's of the world. Point guard defense was left out there for good reason — Bridges may be a fairly good athlete, but he doesn't necessarily have the side-to-side athleticism to play stretches of games guarding opposing point guards. And that's okay! Bridges will supplement that defensive ability with a level of shooting variety that outclassed a lot of his peers in this range. He can shoot in stationary position off-the-catch, coming around screens, and showed development as a pull-up shooter during his time at Nova, all of which are skills the Sixers need. Bridges' percentage at the rim while at Villanova was extremely high up until this season (81.7 percent as a freshman, 79.8 percent as a sophomore), a result of him having to create more of his own offense. When he's not asked to beat guys in isolation, Bridges has both the length and the touch to finish in traffic at the basket. He doesn't have the highest end hops you're ever going to see, but he will immediately be the best-combined shooter and finisher on Philadelphia's roster. Those offensive strengths do not come without warts. Many Sixers fans unhappy with Robert Covington seem excited to project Bridges out as an upgrade over the veteran wing over the long-term. The problem with that projection is that their skill packages aren't wildly different when comparing performance during equivalent college seasons. The same ballhandling trouble that has capped Covington's offensive upside in the NBA has been present dating back to college and his early D-League years. Bridges has a lot of the same problems with the ball in his hands as Covington does and did, and his ceiling will be ultimately be determined by his development there. His shot variety may help him produce more offensive value than Covington, but the latter's defensive aptitude and versatility will likely always outstrip the new Sixers draftee. By the way, if all the Sixers ended up getting with the No. 10 pick was another Covington, they should be thanking their lucky stars. This pick, on top of adding a potential long-term starter to the mix, seems to suggest the team remains confident in Markelle Fultz as a long-term piece. Instead of opting for a player with more creation potential or playmaking ability, the Sixers went and selected a guy who slots right into a theoretical lineup involving last year's No. 1 pick. We'll have more on Bridges in the coming days, but in the immediate aftermath of the selection, it's hard to take much issue with the move.